It’s amazing how an idea can grow. Like a lightbulb turning on, good ideas have a way of helping people see a new path around obstacles. In the case of the Pocket Project, as lovingly named by Katie Nidermaier and her daughter’s Girl Scout troop, the idea of the femPower Belt initially helped to empower one woman during her breast reconstruction journey by fashionably hiding her post-surgery drains has turned into something that is helping countless women during breast cancer surgeries and, now, teaching young girls about the power of sisterhood. Nidermaier, a breast cancer thriver, is co-leader of Girl Scout Junior Troop 1164 with her friend Elizabeth Castelli. The troop of fourth and fifth grade girls learn about compassion, character, sisterhood, and citizenship through different activities and community service. Nidermaier always tries to pick volunteer time that will help the girls develop a good foundation and understanding that others are in need of help and they are being of service to them. 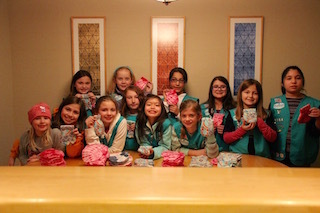 Having been part of femPower Belt workshops to assemble the drain-holding belts for fellow breast surgery patients, Nidermaier and her daughter introduced the troop to the “Pocket Project” for their most recent service project. The girls really enjoyed working on the pockets at the troop meeting. “We explained what the belts are used for and the girls all knew that I went through breast cancer so they could relate to it on some degree,” says Nidermaier. The girls asked to do the project again, so it will be something we incorporate into our meetings again. Since she first attended a femPower Belt workshop with the Sisterhood of Support group convened by the NY Breast Reconstruction Associates, Nidermaier and her three daughters have been involved with the "Pocket Project," a name coined in their house! She brought home the unfinished pockets to finish up and the girls eagerly jumped in to help out. Having gone through her breast cancer surgery, her girls understood what the belts were used for and how helpful they could be. The femPower Belt was created by Erica Misorek while she was facing her own mastectomy and breast reconstructions. Because the drains people have to wear after their surgeries can be unsightly at times, she thought they might scare her young children. So, being creative and determined, she designed and developed the brilliant femPower Belt to conceal her drains while still being fashionable. As part of our Patient Empowerment Program, we are happy to be able to give all our patients their own femPower Belt. It’s all made possible by the power of sisterhood.